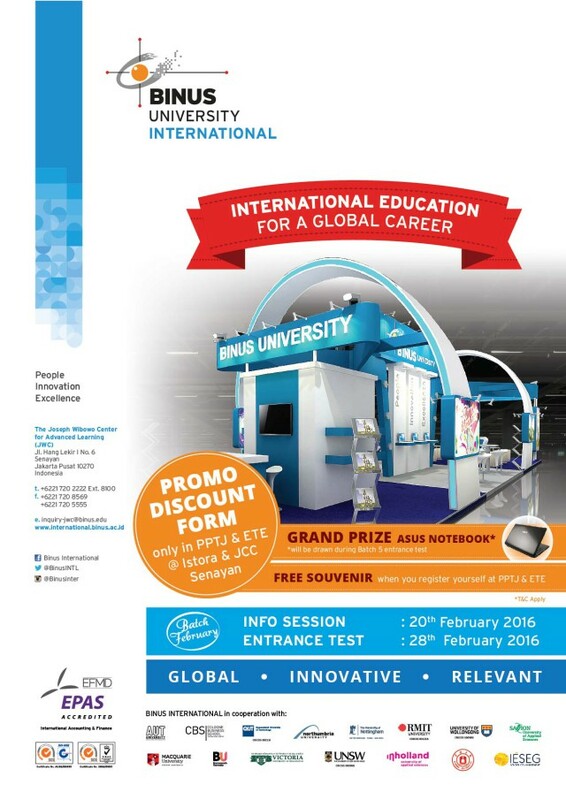 BINUS INTERNATIONAL (BI), part of BINUS University, present at Education and Training Expo (ETE) that held from January 27th – 30th at Jakarta Convention Center (JCC) Senayan. This largest exhibition in the education sector in Indonesia is held every year, supported by Directorate General of Higher Education- Ministry of Education and Culture, Jakarta Provincial Education Department, and related associations. Through this exhibition, visitors gain the opportunity to dig up information on leading educational institutions in Indonesia and overseas. For high school students want to register to BI, there are promo program and some door prizes, such as PROMO DISCOUNT FORM, ASUS NOTEBOOK GRANDPRIZES, and FREE SOUVENIR for students that register at this event. So, please come and register to feel and get experience of International Education for Global Career.